Florida death metal giants coming to OEF for the first time! When we all first heard the Slowly We Rot album at the beginning of 90’s, the vocal of John Tardy was hardly to believe and the blastingly heavy quitar tone of Trevor Peres left you breathless. If you managed to visit their show in 1992 with NAPALM DEATH and DISMEMBER during their Campaign for a Musical Destruction, you will never forget the massacre. The band celebrated its 30 year anniversary last year by releasing a phenomenal record Inked in Blood that sold more than 5,000 copies in the United States in its first week of release to debut at position No. 75 on The Billboard 200 chart. OBITUARY had been working for three years on the album material, raised the funds through a Kickstarter campaign, and released the album by the band itself. The result is possibly their best album in the last 20 years. Regardless if you have seen them recently or not, in the family-like atmosphere of OEF shows the OBITUARY set will be the one you will never forget, total massacre, finito – The End Complete!!! Obituary are one of the pioneering bands of the death metal genre. Founded as Executioner in Seffner, Florida during 1984. They soon dropped the "E" from their name because of another band of the same name, becoming Xecutioner. At the time the band was composed of John Tardy (vocals), Allen West (lead guitar), JP Chartier (guitar), Jerome Grable (bass) & Donald Tardy (drums). The band released demos in 1985, 1986, and 1987, the 1985 demo as Executioner and the 1986 and 1987 demos as Xecutioner. They made their vinyl debut in 1987 with two tracks ("Find The Arise" & "Like The Dead") on the Raging Death compilation. Not long after its release, Grable was replaced with bassist Daniel Tucker. Shortly before the release of its first album the following year, Slowly We Rot, they changed their name to Obituary. The band still remains an influential piece of the Florida death metal movement that arose in the late 1980s. After 1997's Back from the Dead album, the band had grown tired of touring, which led to the band disbanding. During the hiatus, Donald Tardy played in Andrew W.K. 's touring band (during W.K. 's appearance on Saturday Night Live Tardy wore an Obituary shirt). Allen West focused on his two projects, Lowbrow and Six Feet Under while not playing in Obituary. Trevor Peres formed Catastrophic in 2001, which released one album, The Cleansing, in that same year. Obituary reformed in 2003 and Catastrophic continued to exist alongside the reformed Obituary. A reunion album, Frozen in Time, was released in 2005. The band's first live DVD, Frozen Alive, was released in January 2007. Obituary was signed with Candlelight Records for its next two albums, Xecutioner's Return (2007) and Darkest Day (2009), as well as the EP Left to Die (2008). A concert DVD release was also announced for January 2010. In April 2010, Obituary began work on new material for their ninth studio album Inked in Blood, which was released in October 2014. It is the first Obituary album not to be recorded with longtime bassist Frank Watkins since their 1989 debut album Slowly We Rot as well as the band's first release on Relapse Records. Since 2012, the band have been highly involved with the promotion of a new social networking site called Unation, as well as Donald Tardy beginning a Cat Sanctuary organization called Metal Meowlisha, an organization practicing “trap-neuter-vaccinate-return”, and caring for 25 cat colonies (200 cats). In 2013, the band rebuilt their studio, and continued work on the new album, with Tardy claiming that the band's progress in the studio will be documented on the new website. 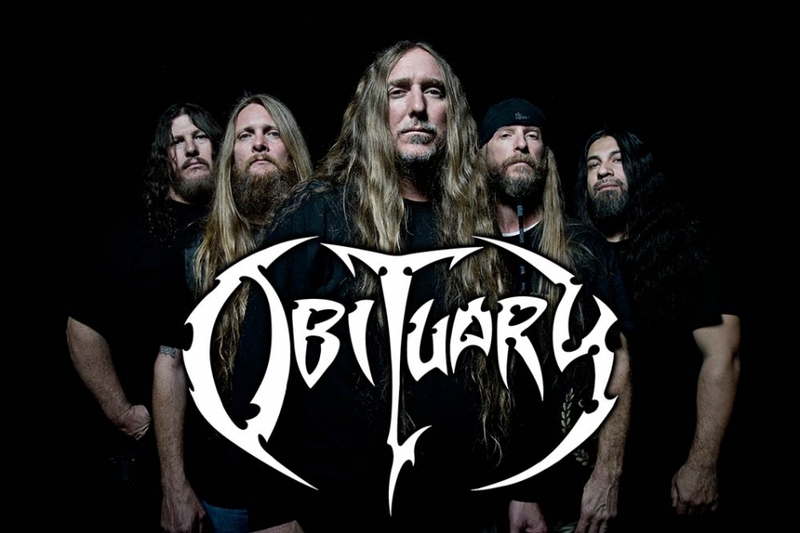 On Friday, August 2, 2013, the band launched a Kickstarter campaign with a goal of raising $10,000.00; the money raised was promised to allow Obituary to record and release their ninth album independently. The goal was met in on August 3, and is still climbing. Obituary has claimed that if the amount of money earned through the campaign extends to 20,000 dollars, the band will release a 4-part documentary style video filmed at the legendary Morrisound Recording Studios in Tampa, Florida. Morrisound is credited with the popularization of heavy metal, and its subgenre death metal. The band Obituary recorded their most popular, and still most loved albums of their career at Morrisound. The Kickstarter "Morrisound Experience" documentary is said to be shot over three days in which the band revisited their roots, and will include sets from "Slowly We Rot," "Cause of Death" and "The End Complete." When interviewed by metal webzine All About The Rock, John Tardy said of the Kickstarter campaign, "This campaign has been awesome and just confirms again what we already know and that is that we have the greatest fans in the world. We are using Kickstarter to raise enough money to release an album on our own. This is not a bash against record companies, it is just what we want to do. Years ago this would not even be a thought, but today we feel everything is in place for us, for better or worse, give it a shot.". Obituary to Release "Inked in Blood" October 28th, 2014. Death metal legends OBITUARY make their Gibtown/Relapse debut with Inked In Blood, their 9th full length LP. Almost three decades in, Inked In Blood stands out as one of the finest moments in OBITUARY's already godlike discography. Inked in Blood will be released October 28th in North America (UK/World October 27th & Germany/Benelux/Finland on October 24th) via Gibtown Records & Relapse Records.